BELGIUM’S Thomas Pieters claimed a second successive European Tour victory as Lee Slattery bogeyed the final hole at the KLM Open in the Netherlands. Slattery, a joint overnight leader and winner of last week’s Russian Open, had the chance to match Pieters’ 19-under-par clubhouse total and force a play-off at Zandvoort but missed a five-foot putt on the 18th. That meant Slattery dropped into a tie for second on 18 under alongside Spain’s Eduardo de la Riva, and Pieters triumphed by a single shot. Pieters, who won his maiden title at the Czech Masters on his last outing a fortnight ago, began the day two off the lead and moved into contention with four birdies on the front nine. 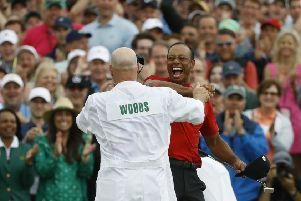 He picked up another shot on the tenth and – although he immediately gave that back with a bogey on the 11th – another birdie at 13 put him on course for a five-under-par round of 65. Pieters was pleased with his victory but admitted he was nervous watching Slattery, who carded a 68, coming in. He said: “I’m really, really happy. I felt like I played better in the Czech Republic, but my short game was great this week and saved me many times. “I rolled in a couple of good ones early in the round and made a really good par save on the ninth which kept the round going. I had chances coming in and I felt like I needed to make a couple more. Rafael Cabrera-Bello, who also had a share of the overnight lead, finished in a tie for seventh on 15 under after a one-over 71. Paraguay’s Fabrizio Zanotti took fourth on 17 under after a superb 63. England’s Eddie Pepperell shot 64 to finish tied fifth on 16 under with Morten Orum Madsen of Denmark. Aberdeen’s Paul Lawrie finished five shots off the pace after a closing 71. On the Challenge Tour, meanwhile, Sebastien Gros claimed the biggest victory of his career as he won the Kazakhstan Open by one shot at Nurtau GC to jump to the top of the Road to Oman rankings and guarantee himself a place on The European Tour next season. The Frenchman looked to be running away with it, opening up a three-shot lead with eight holes to play, but Denmark’s Mads Søgaard, playing alongside Gros in the final pairing, fought back to tie the lead with five holes to play. Nerves affected both players as they each made two bogeys down the final stretch to stand level coming down the 18th, but Gros made par to take his second victory of the season following his win at the Najeti Open. “I started the round so well,” he said. “Through nine holes I was in a great rhythm but then we were told we were playing too slowly and when we sped up I started making a few mistakes. “I was struggling a bit as the greens were getting slower with the rain but thankfully I’d done a great job before and that was enough. “I’m sorry for Mads because he played really well and never gave up, and he only had a short one to get into a play-off, but I’m so happy to have won. Behind the leaders there was a four-way tie for third place between Sweden’s Jens Fahrbring, American Daniel Im, Scotland’s George Murray and Englishman Callum Shinkwin.